The ability to walk independently is a prerequisite for most daily activities. The capacity to walk in a community setting requires the ability to walk at speeds that enable an individual to cross the street in the time allotted by pedestrian lights, to step on and off a moving walkway, in and out of automatic doors, walk around furniture, under and over objects and negotiate kerbs. A walking velocity of 1.1-1.5 m/s is considered to be fast enough to function as a pedestrian in different environmental and social contexts. It has been reported that only 7% of patients discharged from rehabilitation met the criteria for community walking, which included the ability to walk 500 m continuously at a speed that would enable them to cross a road safely . Poststroke hemiplegic gait is a mixture of deviations and compensatory motion dictated by residual functions, and thus each patient must be examined and his/her unique gait pattern identified and documented. Walking dysfunction is common in neurologically impaired individuals, arising not only from the impairments associated with the lesion but also from secondary cardiovascular and musculoskeletal consequences of disuse and physical inactivity. Muscle weakness and paralysis, poor motor control and soft tissue contracture are major contributors to walking dysfunction after stroke. Limited ankle dorsiflexion - decreased activation of anterior tibial muscles ; contracture and/or stiffness of calf muscles with premature activation. Lack of Knee Extension (knee remains flexed 10-150 with excessive ankle dorsiflexion) - decreased activation of calf muscles to control movement of shank forward at ankle (ankle dorsiflexion) ; limited synergic activation of lower limb extensor muscles. Stiffening of Knee (Hyperextension). This interferes with preparation for push-off - contracture of soleus ; an adaptation to fear of limb collapse due to weakness of muscles controlling the knee. Limited hip extension and ankle dorsiflexion with failure to progress body mass forward over the foot - contracture of soleus. Excessive Lateral Pelvic Shift - decreased ability to activate stance hip abductors and control hip and knee extensors. Lack of Knee Flexion and Ankle Plantarflexion, prerequisites for push-off and preparation for swing - weakness of calf muscles. Limited Knee Flexion normally 35-40° increasing to 60° for swing and toe clearance - increased stiffness in or unopposed activity of two-joint rectus femoris ; decreased activation of hamstrings. Limited Knee Extension and Ankle Dorsiflexion jeopardizing heel contact and weight-acceptance - contracted or stiff calf muscles ; decreased dorsiflexor activity. dependence on support through the hands. Push off / Calf rise. Body weight supported treadmill training was one of the first translations of the task-specific repetitive treatment concept in gait rehabilitation after stroke. Through a systematic review of 6 RCTs of Body Weight Supported Treadmill Training (BWSTT) and 2 RCTs without BWSTT, Teasell et al. concluded that there was conflicting evidence that treadmill training with or without BWSTT resulted in improvements in gait performance over standard treatments. Although the evidence supporting treadmill training appears to be conflicting, two recent clinical practice guidelines recommended that BWSTT be included as an intervention for stroke. increased training motivation through the use of interactive (bio)feedback. In addition, this approach reduces the amount of physical assistance required to walk reducing health care costs [88,91] and provides kinematic and kinetic data in order to control and quantify the intensity of practice, measure changes and assess motor impairments with better sensitivity and reliability than standard clinical scales. ↑ Hill K, Ellis P, Bernhardt Jet al. 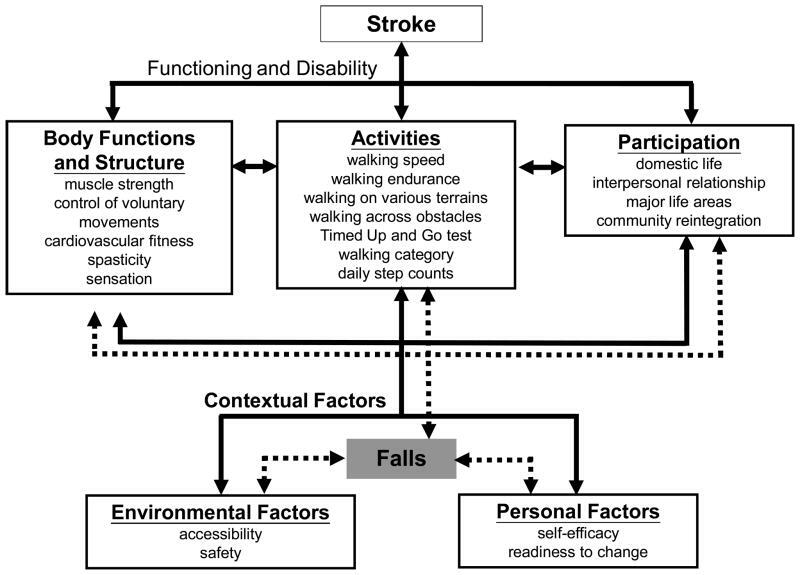 (1997) Balance and mobility outcomes for stroke patients: a comprehensive audit. Aust J Physiother, 43, 173-180. ↑ 6.0 6.1 Janice J Eng, PhD, PT/OT, Professor and Pei Fang Tang, PhD, PT ;Gait training strategies to optimize walking ability in people with stroke: A synthesis of the evidence; Expert Rev Neurother. Oct 2007; 7(10): 1417–1436. ↑ Lennon S, Baxter D, Ashburn A. Physiotherapy based on the Bobath concept in stroke rehabilitation: a survey within the UK. Disabil Rehabil. 2001;23(6):254–262. ↑ Teasell RW, Bhogal SK, Foley NC, Speechley MR. Gait retraining post stroke. Top Stroke Rehabil. 2003;10(2):34–65.